» Forum » Tech » Tech: Alpha-numeric » Purpose of pair 150 microfarad caps on speaker? » Purpose of pair 150 microfarad caps on speaker? Purpose of pair 150 microfarad caps on speaker? On a friends FH, there are these caps on the speaker. Is this to change the impedance? And what's the coil on the speaker housing tied into the speakers? I had a FH but hadn't seen this before. This is a crossover to filter out high end, a low-pass filter. Normally, you would use a single bipolar electrolytic cap, but they are more expensive, so you can just wire two normal ones like this to make a bipolar one. In other words, it isn't necessary to make the speaker work properly. A passive cross-over like this would alter the impedance, because impedance changes with frequency. AC is a confusing thing. My guess would be an attempt to try to cut down on high frequencies through the speakers, either noise or maybe an attempt to build a rudimentary crossover if the speakers are wired in series. Putting the two caps in series halves the capacitance, so it's effectively like putting a 75uF cap on there. But I'd be concerned about reverse biasing the caps unless there was something else connected to the side that's tied together. Ok thanks to you both! That makes sense. Odd about the coil. The machine does have a knocker in the normal upper left of back box so it's not a knocker. Ok, sure, that makes sense. Just to be diligent; the caps may also play a role in blocking any DC component of the audio signal. Many LM386 audio amps run from a single supply; which means that may be biased with a dc offset so you don't get clipping. 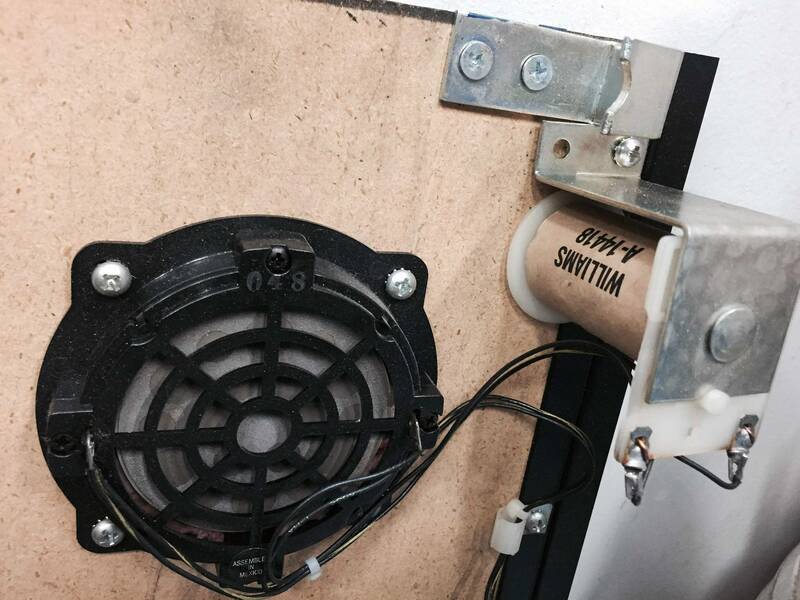 Just make sure you don't completely remove any caps on your speaker without consulting the audio circuit. Thanks Zitt. It was working fine this way he said. We may leave well enough alone until we can confirm everything is working as it should. Re: the coil . 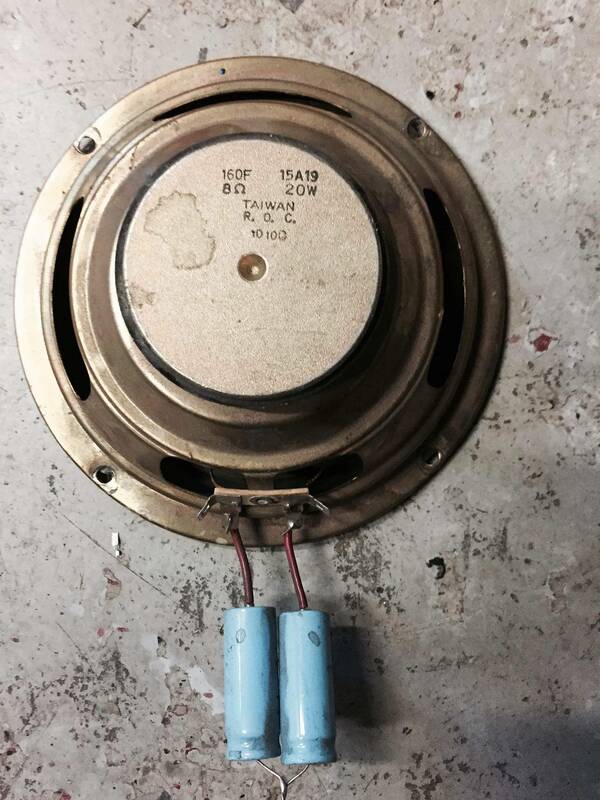 . . An older RGP post indicates that A-14418 is a choke, meant to filter out the bass sounds in the backbox speakers (leaving them for the main cabinet speaker). There is no plunger in the coil. Funhouse manual & parts list calls A-14418 a "x-over coil assy" and A-14292-1 as the "x-over coil & brkt assy". any coil can be a choke. However i thought that a choke coil was for filtering out high end. I do this regularly with extra coils i have laying around and different value coils will cross over at different frequencies. I have a 23-800 on T3 which sounds amazing but it cut out midbass in GnR so i used an old em coil which worked better. To be clear, I know nothing about chokes or audio circuits I am just re-posting what I found. 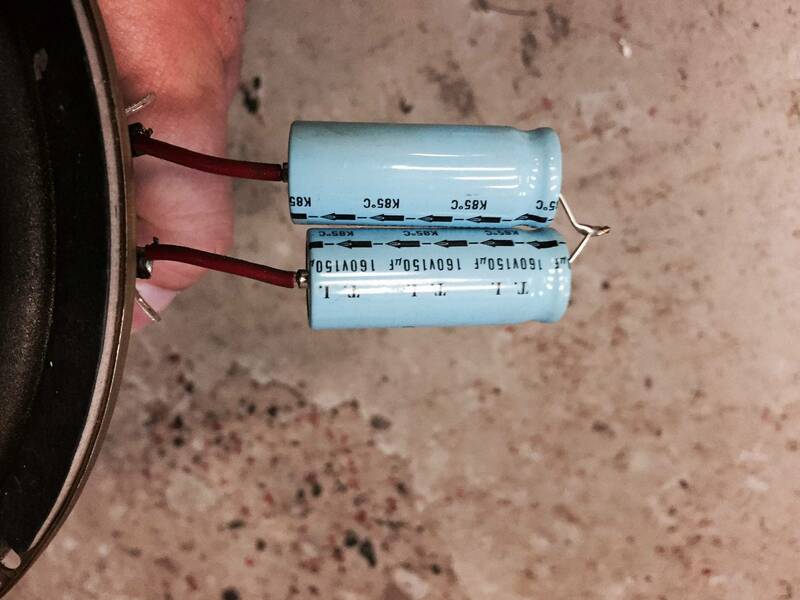 A capacitor blocks bass from getting to a tweeter or midrange. A choke blocks higher frequencies from getting to a subwoofer. Thanks again to all. As a follow up, I have found some other photo galleries that show the same caps on the bottom speaker including one from HEP's gallery. We did keep things as they were and had to ask about how the IDC connectors were to be placed on the sound board (each pair of wires had a wire pulled from the IDC). Surprisingly there wasn't lots of pictures showing these connections including my own FH. The speakers sound fine but I'd feel better seeing how these connections with a picture confirming these are correct.